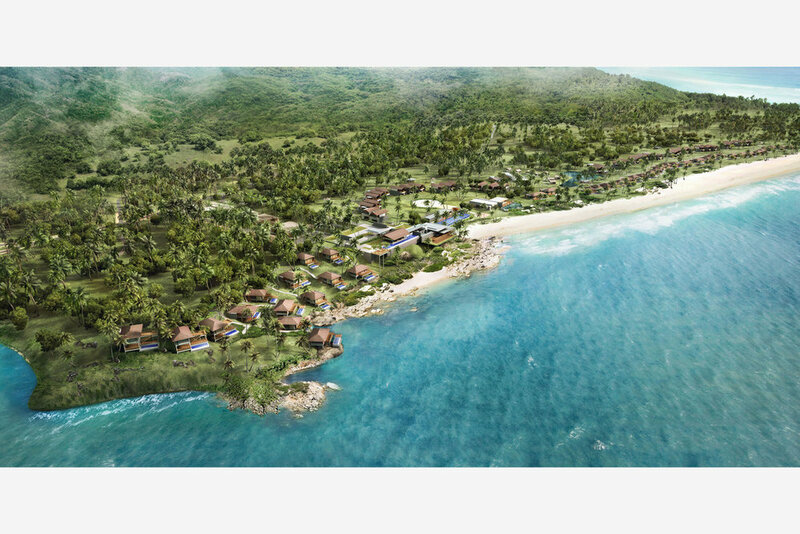 Nestled on the eastern side of Bintan Island, the resort sits amidst lush tropical greenery and offers guests and visitors breathtaking views of the ocean. The planning strategy is to ‘touch the earth lightly’ and minimise disturbance to the natural landscape. Building structures are designed to preserve existing terrain with the Main Reception Building placed at the summit. The journey into the resort unfolds with a series of scenic views, welcoming visitors with natural-lit spaces and sculptured landscapes. The elevated arrival point greets visitors with expansive views of the horizon. Buildings are placed sparsely within the site to offer guests maximum privacy and intimacy with nature. The design incorporates large unobstructed views and extensive sheltered outdoor spaces, providing shade from the harsh tropical climate. Timber deck at the entrance to each of the villas blurs the boundary between the inside and the outside. Other tropical design elements include large overhangs and expansive terraces. The villas and suites are sculpted in clean-cut rectilinear forms placed along the shoreline, allowing for views and proximity to the beach. The open plan and linear composition of the interior spaces coupled with the use of large glazed panels offer visitors and guests unobstructed views of the sea. The use of local materials such as timber roof shingles and thatch roofing forms the basis of the vernacular architecture. The focus of the design of the resort is in the clarity in the site planning, simplicity in terms of the relationship between the spaces and honesty in the construction language.